Below we reproduce Joint Enterprise Not Guilty by Association’s (JENGbA) statement on the recent Amnesty International report on the Gangs Matrix. JENGbA welcomes the damning Amnesty International report that highlights the government’s racist, bogus war on gangs. 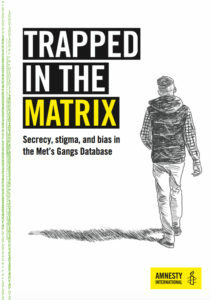 The Met’s gang-mapping database, known as the Gangs Matrix, lists individuals as ‘gang nominals’ with each given an automated violence ranking from green to amber and red. As of October 2017, 3,806 people were on the Matrix. Around 40 per cent of these have no recorded involvement in any violent offence. 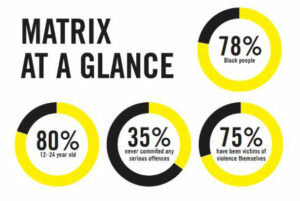 Meanwhile more than three-quarters (78 per cent) of those on the Matrix are black – a disproportionate number given that the Met’s own figures show 27 per cent of those responsible for serious youth violence are black. The youngest person on the Matrix is 12 years old and 99 per cent of those listed are male. The Gangs Matrix fits conveniently with the Joint Enterprise doctrine. It allows the police to choose defendants that a Crown Prosecution Service (CPS) prosecutor can easily design a gang narrative around in order to gain a conviction – very often for murder which comes with a mandatory life sentence. It is usually young black men as it is easier to convince a jury that young BAME men are all gang members. JENGbA have argued for years that Joint Enterprise (JE) is racist. The evidential bar in JE cases is far too low and the use of the gang narrative with a possibility of foresight that a crime ‘may or might’ occur is not acceptable. Most of the people that JENGbA supports are described in courts and the media as having committed gang-related offences. Our own research has revealed that many of those we support have never been convicted of any other offence prior to the JE charge (usually of murder) and do not consider themselves to be part of a gang. Below are responses we received when we asked those convicted of murder whether the ‘gang’ narrative was relied upon by the CPS. CPS showed Instagram account as proof of gang association. Evidence against a co-defendant was that he was in a ‘gang’. And the CPS assumed because we knew each other, I must in a gang too. CPS evidence of gang membership was a music video on YouTube featuring defendants. Membership of a motorcycle club was perceived as a gang by the CPS. Attire and clothing was brought up as evidence in the gang narrative. The incident was described as a gang ambush/turf dispute. The evidence was CCTV of defendants shopping in Westfield. A music video and tattoo were used as evidence of gang membership. Phone calls between co-defendants were described as gang-related, however they were just friends. They were also described as ‘Lithuanian foot soldiers’. CPS described the defendants as ‘Yarmouth 5’, a ‘pack of wolves’ and a ‘tag team’. CPS used song lyrics on a phone to prove gang association and the glorification of knife crime. Involved in music representing a particular area was described by the CPS as gang-affiliated. CPS used pictures on a phone as evidence of gang membership (co-defendants were family and friends). The report really says it all and the evidence that the Matrix is too broad is overwhelming. It cannot be called ‘data’, it is a narrative fuelled by institutional racism. Worse, this report highlights the way the Gangs Matrix is shared across agencies so that negative ideas about a child are passed from schools to social services to the police, resulting in the widespread targeting of young black children. In terms of criminal prosecutions and JE, the fact that the CPS relies so heavily on the gang narrative is telling, as it shows they often have little or no evidence against individuals. The idea that clothes, phone calls, YouTube footage, song lyrics, tattoos or previous friendships are enough to convict individuals of murder is abhorrent and defiles the most important of legal principles – that you are ‘innocent until proven guilty’. The cases detailed above are overwhelmingly of young BAME men. The public are fed a constant stream of misinformation about ‘gangs’ involving young black men, so that if the police and prosecutors decide to charge large groups for the actions of one or two individuals and tarnish them all with gang associations then juries will believe they are all ‘in it together’ and convict. Indeed, in one recent case the judge said to seven west London school friends aged between 13 and 16 (all black): ‘You may not have been in a gang but you were a gang on the day.’ Chilling and racist; this is the current state of our criminal justice system; one which is no longer fit for purpose.